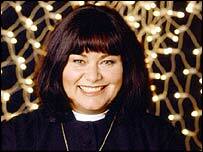 Comic Dawn French has landed a role in the third Harry Potter movie, just a few weeks after her TV spoof of the films for charity Comic Relief. French will play a character called the Fat Lady in Harry Potter and the Prisoner of Azkaban, on which filming recently begun. In the BBC's Comic Relief fundraising marathon on 14 March, French played the boy wizard in a send-up of the first two films in the series. Christopher Columbus, director of the first two Harry Potter movies and co-producer of the third, told BBC Three's Liquid News: "Yes, Dawn French is playing the Fat Lady. 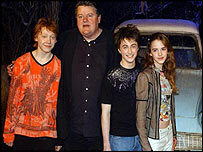 "I think she's incredibly funny and her Harry Potter spoof for Comic Relief was pretty amazing." The Fat Lady will feature in a number of scenes in the film as a talking painting. French is known best as a TV comedy star, particularly for her work with Jennifer Saunders and in the BBC One sitcom The Vicar of Dibley. But she has also taken more dramatic roles in the TV series Murder in Mind and Ted and Alice. The Harry Potter movies are based on the best-selling books by JK Rowling. The second film, the Chamber of Secrets, took £53m at the UK box office when it was released shortly before Christmas last year. The DVD, released worldwide on 11 April, looks set to become one of the biggest sellers of all time. Pre-orders in the UK have exceeded half a million.